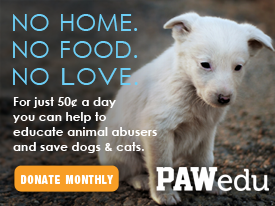 We need your support to put a stop to animal abuse. Inspire action and provide education at the grassroots level. Connect people and build awareness across the entire United States. Create a positive, effective path to tackle animal cruelty. 93% of all money given to PAWedu goes directly to delivering results.